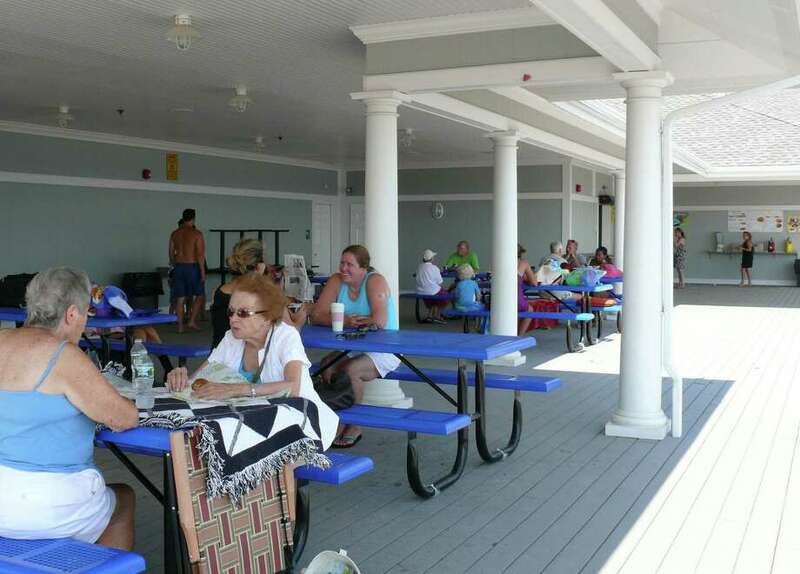 Beachgoers enjoy the new deck at Penfield Pavilion. As the summer winds down, so does the Penfield Pavilion reconstruction project. Penfield Pavilion Building Committee Chairman Jim Gallagher has sent a request to the Board of Selectmen asking that the panel overseeing the several-years-long reconstruction of the shorefront pavilion, which finished its work with a small surplus, be disbanded. "The facility is in use and has generated greater revenue than expected," Gallagher's memo states. The building project's budget has an unspent balance of $13,535 that the building committee has voted to transfer to the Parks and Recreation Department's revolving fund to offset costs of the purchase and installation of a commemorative plaque and acoustical panels. The overall Penfield project, done in two phases, cost about $5.5 million overall, officials said. The first phase replaced the building's east wing and was completed in 2008. The second phase, which includes a rental hall and new food concession, was completed and opened to the public in August of last year. That phase cost $3.3 million. A new seawall that has been installed to fortify the revamped building cost about $234,000 and money to pay for that work came from the building committee budget. That was possible, according to town officials, because a state grant was secured to pay for the parking lot's paving, the costs of which were originally included in the project budget.